All languages have various methods for reporting speech, or quoting other people. English is particularly difficult for learners because of the tense and pronoun changes traditionally used. But according to corpus research, there are many ways that native speakers themselves get round this problem – as it’s not only English learners that have problems with Reported Speech! The image at the top of the page shows a sign outside a school in Croydon, London from 2013. 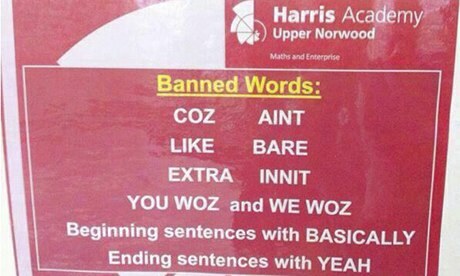 This is a list of ‘banned words’ and was organised in an attempt to improve the speech of the young people at the school, the reason for this being that the language used by the pupils at the school was too informal* (You can find the whole story here). Also, if you’re interested in the banning of words then I’d recommend Verbal Hygiene by Deborah Cameron which goes into detail on how institutions have tried to control language use over time. 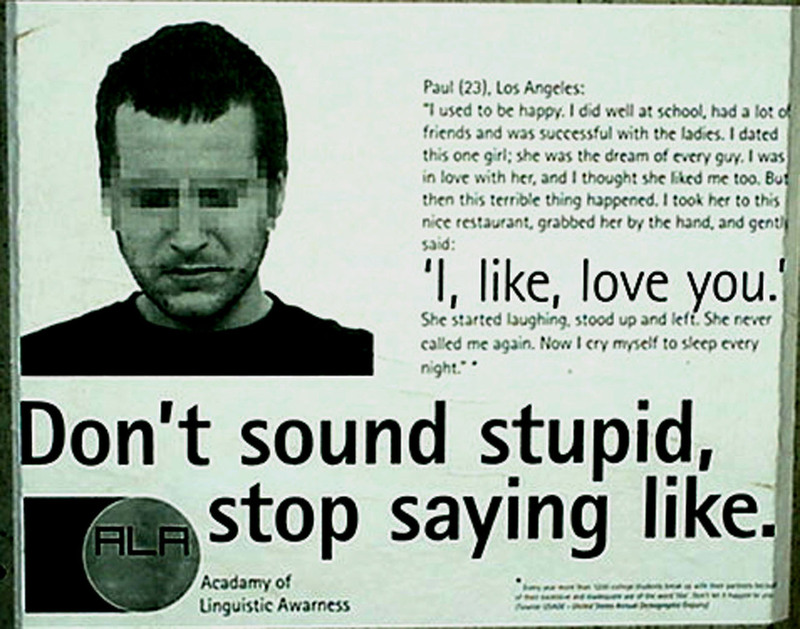 Quotatives would thereby seem to be one area where we can see language evolution in progress. Interestingly, other languages seem to be developing new quotatives as well, such as van (Dutch), kaze (Hebrew), so (German), genre (French), tipo (Italian), tipa (Russian), typu (Polish), ba (Swedish), and olsem (Bislama). Debates are ongoing about why the quotatives are changing but it seems that Globalisation plays a major role. Which English do we teach – the English in the textbooks or the English in common use? For this lesson I decided to use worksheets from A Handbook of Spoken Grammar by Ken Paterson et al., which I mentioned in a previous post. I used the free sample material for Unit 14 – Report Speech in a More Immediate Way, available here. It’s also important to note that this work on Spoken Grammar is based on Corpus Research which identified common language ‘habits’ of native speakers when reporting speech. Interestingly, the like quotative is not given here, maybe because of some of the bad press it’s been receiving! As in the book, I wanted to introduce the learners to the four main ways of avoiding backshifting (taken from p.60/61 of the above material). So how did I start the class? 1) I wrote on the WB “Then John said ‘It’s late, I’m going home.‘” I asked the concept check questions: Who is going home? Is anybody else going home? Why is he going home? There’s no real confusion here – so using Direct Speech is fine. John (at a party, talking to Pete): You’re crazy! You couldn’t use Direct Speech here if you were reporting this sentence to someone else, because it would be confusing e.g. A:What did John say at the party? B: He said to Pete that you’re crazy. Who is the you here? Is it Pete or person A? A better answer would be ‘He said that Pete was crazy’. Using was indicates a kind of semantic distance, so we know that this is reported speech. The textbook answer would be: ‘The teacher said that he had marked our homework and (that) we had all done really well’. Is that clunky or what? I then told the learners that they were going to learn some ways of avoiding complicated backshifting. 4) From p.60/61 ‘Report Speech in a More Immediate Way’ I gave a short WB presentation on the three further ways (after Direct Speech) of avoiding Backshifting – Marker words, Informal use of say(s), go(es) and went. I used examples from the text as well as my own. 5) I then gave the learners exercises 1 to 4 on p.62 and 63 which I had blown up and cut up into sections earlier. 6) I put the learners into groups and asked them to think of a recent situation where someone spoke to them at work about something important (e.g. an update). I then asked them to, in pairs, prepare to report this information to another group using all four of the ways we had spoken about – using Direct Speech, Marker Words, Informal use of Says, Goes etc., and Past Continuous. One group used the example of a presentation they had gone to that week. 7) The learners read out their reports and I gave them some brief feedback. They actually did the exercise very well, and there wasn’t the long pause while everyone thinks of the right tense to backshift to! The reason why I couldn’t think of anything more imaginative to do for stage 5 was that I really wanted to find examples of films using these ways of reporting speech but couldn’t really find anything suitable – and I ran out of preparation time. But, when planning the lesson I didn’t include Like as a quotative, and I’ve since found quite a lot of material using Like (see here for a useful synopsis of the spread of this quotative in the US) so next time I’ll have a wider range of materials. If I were to do the lesson again I would change stage 5 – getting learners to do gap-fills isn’t really my idea of Decentralised Teaching! Also, the level was far too low for my group, they whizzed through the exercises. What’s also missing from this lesson is a conversation stage, as this is where we use Reported Speech – to re-tell important events, share information (or gossip!) and tell stories. In Stage 6 I might give the following task: Learners tell each other about a positive or negative encounter with a colleague or their boss at work. Then I could also build in some work on discourse markers for maintaining a conversation and showing interest. But how useful is this – and what about BELF (Business English as a Lingua Franca)? One learner asked me at the end of this lesson ‘Can we use these marker words only in Speech? What about emails?’ Which brings me to a big problem – the question of register. In answer I said that in more formal contexts, writing a formal letter or email you still need to backshift a lot of the time- you couldn’t use a Like quotative here without running the risk of sounding very casual and informal. Having said this, I think what is vitally important is that learners are able to report speech in formal and informal contexts efficiently and without hesitation. That is why I think that the four ways of avoiding backshifting are useful. Moreover, as so much international business is now centred on non-natives communicating with other non-natives, what we teach in the classroom should surely move with the times. Therefore I think that merely teaching learners to backshift without giving them other strategies doesn’t prepare them adequately for today’s working world. If you’re interested in Business English as a Lingua France, here’s a nice introduction made by Vicki Hollett (you can find her blog here also, which is well worth a read). Didn’t you say 4½ ways of Reporting Speech? Ok, that’s enough from me – hope that you found this post interesting and useful – if you can help me develop this lesson further then please drop me a line. Buchstaller, Isabelle. (2001). He goes and I’m like: The new quotatives re-visited. Paper presented at NWAVE 30, University of North Carolina. Available here. 1. On an empty page of A4, Learners have 1 minute to write down all the people they spoke to that day. 2. Put the learners in pairs, they swap papers and ask ‘What (exactly) did ……. say to you?’. Each person in a pair takes a turn in reporting. 3. Teacher monitors and gives feedback after the activity. This entry was posted on January 13, 2014 by paulwalsh in DCT in action, For Teachers, Lessons and tagged backshifting, BELF, corpus research, Decentralised Teaching, Decentralized Teaching, direct speech, Grammar, Learner strategies, like, quotatives, reported speech, spoken grammar.